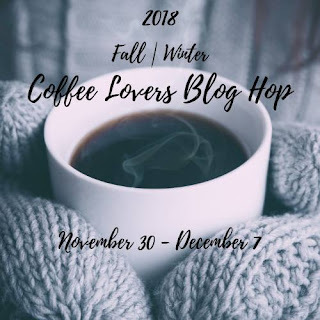 Newton's Nook Designs: 2018 Fall/Winter Coffee Lovers Blog Hop! This is our second post today, to see a gorgeous set of winter bird cards by Ellen, scroll down or click here. Today I'm playing along with the FALL/WINTER Coffee Lovers Blog hop! We have several coffee themed sets so it's hard to choose but I decided to work with the cute kitty from our Sending Hugs Stamp Set for my card today. I love this set so much because the coordinating die set cuts around the arms which allows you to add in accessories for the characters to hold. On this card, I added in the little coffee cup tucked into his arms to go with our coffee them today. For the background I created a fun blue and mint plaid pattern using our new Plaid Stencil Set. 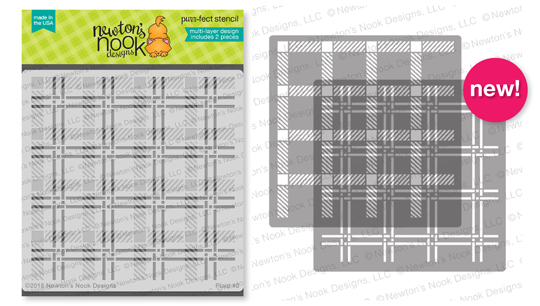 This set includes two pieces that easily line up so you can create plaid patterns in multiple colors! It's SO fun to use! 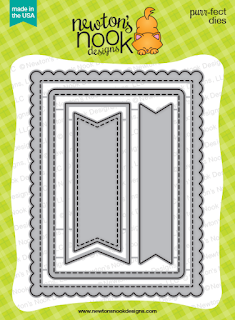 After I had the plaid background panel created, I cut it into scallop using our Frames & Flags Die Set. I also cut a stripe of white and of mint paper using the same die set and stacked them together over the plaid. I stamped the "sending smiles" sentiment from the Sending Hugs Stamp Set on the mint stripe and added some bright blue twine to finish out the card! This was so simple to make and I LOVE how it turned out! We also have a BUNCH of designs that have coffee in them. Hope you enjoyed this coffee card today! Make sure you head over to the Coffee Lovers Blog to find out how you can link up your card to play along -- There are a TON of prizes, including one from us at Newton's Nook Designs! Oh Jennifer...this is simply adorable! I love that plaid background! 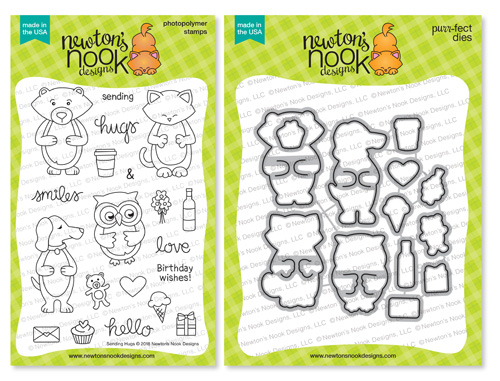 Thank you to Newton's Nook for being a Super Sponsor!!! Love me some coffee - Thank you for sponsoring the Fall and Winter Coffee Lovers Blog Hop! Nothing cuter than a kitty, unless its a kitty with a coffee cup! Love this! Cute and adorable Kitty! Thanks for being a super sponsor! So cute Jen! Loving that new plaid so much and of course, Newton! Thanks for being a returning Super Sponsor! Ahhh...dorable!!! Love the colors and that plaid is so cute! Thank you for being a Super Sponsor! Loving all of the products used on your card!!! Sweet card and darling image. Thanks for sponsoring the hop. Always wonderfull to see Newton on a card. Like the colours you have used for the card. Thank you for being a sponsor on this 2018 Coffee fall/winter blog hop. Very fun card...love the use of the pattern on the top! Awesome project! I especially love that plaid background! Love your project with the plaid! Can't wait until my stencils arrive! Thanks for being an ongoing Super Sponsor to this wonderful blog hop! This card does bring smiles. Thanks for being a super sponsor. Me encanta el color y lo bonito que resalta el gatito. Your images are always too cute and love all the cards. Thanks for being a great sponsor to the coffee hop. Like the critter stamp/die hugging a wonderful drink. Wonderful card and I love the coffee they can hold! So cute with Newton and the plaid background. I love Newton with his cup of coffee. So cute!! A super cute card, Jen! I love those clever stencils! (and of course that fun little coffee drinking cat!) Thanks so much for the inspiration! Love this sweet card and oh that plaid stencil!! I need it! Thanks so much for being a sponsor once again! Sweet card! Thanks for being a Super Sponsor! Fabulous card!! Wonderful creative products!! Thanks for being your one of our super sponsors! Such a fun and cheerful card! Simply adorable! Thanks for the inspiration and sponsoring the hop. It's always fun seeing Newton enjoy his coffee. Thanks for sponsoring this AWESOME event, and for your wonderful inspirations. This is so much fun! Thank you for being a sponsor!!! What great projects on your blog! Lucky kitty! Just a darling card. I love the plaid stencil background. And love to hear about your kitty. So funny he likes coffee. Thanks for sponsoring. wow! What a cute card!! First, the adorable kitty! 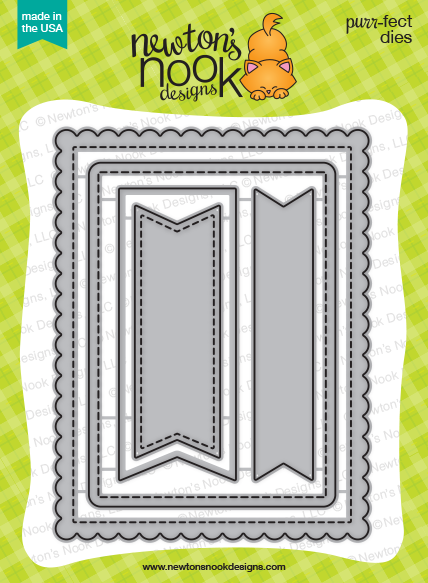 Second, the super fun plaid stencil background! fabulous! Thanks for being a super sponsor! Newton and coffee! Love it! So cute! Thanks for sponsoring. I LOVE how adorable sweet Newton looks with his mug! Love the colors and the design. It is so wintery sweet! THanks for being a super sponsor!!! It's always a delight to see Newton, no matter what he's doing (or not doing. LOL!)! Thanks for once again sponsoring this fun hop!